This artist rendering shows the TRMM satellite orbiting over a hurricane’s eyewall. April 10, 2015 – In 1997 when the Tropical Rainfall Measuring Mission, or TRMM, was launched, its mission was scheduled to last just a few years. Now, 17 years later, the TRMM mission has come to an end. NASA and the Japan Aerospace Exploration Agency (JAXA) stopped TRMM’s science operations and data collection on April 8 after the spacecraft depleted its fuel reserves. TRMM observed rainfall rates over the tropics and subtropics, where two-thirds of the world’s rainfall occurs. TRMM carried the first precipitation radar flown in space, which returned data that were made into 3-D imagery, enabling scientists to see the internal structure of storms for the first time. TRMM also carried a microwave imager, a state-of-the-art instrument that had the highest resolution images of rainfall at the time. Together with three other sensors – the Visible and Infrared Scanner (VIRS), the Lightning Imaging Sensor (LIS), and the Clouds and the Earth’s Radiant Energy System (CERES) instrument – scientists used TRMM data to explore weather events, climate, and Earth’s water cycle. The cutting-edge TRMM instruments arrived in orbit at the right time to take advantage of the explosion of computing power and major advances in data-sharing. Scientists at Goddard originally intended TRMM’s data to be used purely for precipitation research, but before long, people and organizations outside NASA were using it for a variety of purposes. 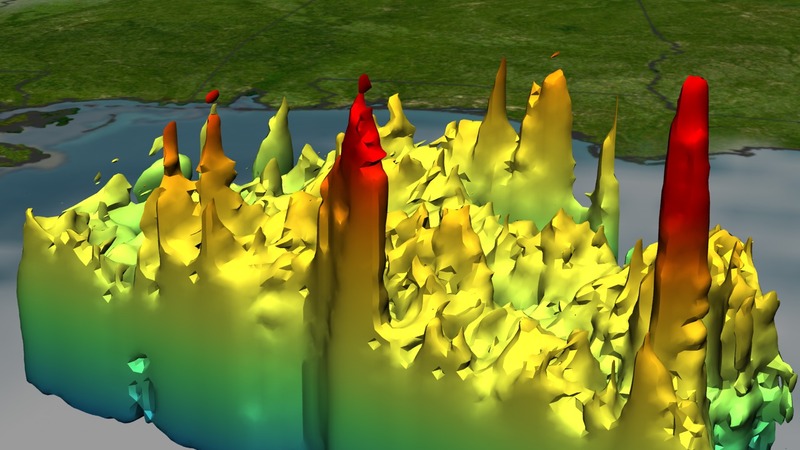 The scientific community considered TRMM’s data so critical to research and many practical applications that in 2001, at the end of TRMM’s primary mission, NASA wanted to extend the mission for as long as possible. TRMM’s original flight altitude was optimized for the precipitation radar. To obtain precipitation profiles through the depth of the lower atmosphere and to concentrate the measurements in the tropics, the orbit was confined to 35 degrees north to 35 degrees south latitude at an altitude of 350 km (217.5 miles). At this altitude, Earth’s atmosphere is still sufficiently dense to cause drag on the spacecraft, slowing it down, which progressively lowers its altitude. To extend TRMM’s mission life, NASA boosted the spacecraft’s orbit altitude to 402.5 km (about 250 miles) in 2001. Earth’s atmosphere thins as it stretches out toward space, so a spacecraft at higher altitudes experiences less drag (that slows it down) and consumes less fuel to maintain its orbit. At this altitude, the radar would still return strong, research quality data. This maneuver extended TRMM’s life four more years, and after review in 2005, NASA again extended the mission life until the satellite ran out of fuel. TRMM’s 17 years in orbit allowed the mission to grow and evolve, Huffman said. The original goal was to provide monthly averages of rainfall over Earth’s surface divided into large grid boxes, roughly 500 km (about 310 miles) square. TRMM eventually generated rainfall estimates at a higher resolution and in near-real time, every three hours. Huffman and his team combined TRMM data with precipitation data from several other microwave imaging satellites in orbit, many of them weather satellites. Together with significant advances in data management they created the new TRMM product. Now, TRMM has reached the end of its life. Battery issues complicated the operation of the spacecraft over the past year, so Braun and the mission operations team had to make decisions about how to ration what power remains. In March 2014, they decided to turn off the VIRS instruments to extend the battery life. In July 2014, the spacecraft ran out of fuel that kept it at its boosted operational altitude and TRMM slowly began to drift down, while still collecting data. The remaining fuel, initially reserved to avoid collisions with other satellites or space debris, was depleted in early March 2015. Observations of hurricanes and precipitation from space will not end after TRMM. The Global Precipitation Measurement (GPM) mission’s Core Observatory, launched in February 2014, succeeds and improves upon the TRMM project. Both missions are joint projects of NASA and JAXA. Since TRMM’s launch, many other space programs, including those in Europe and Japan, have launched precipitation measurement satellites containing microwave radiometers that measure radiated energy from rainfall and snowfall. 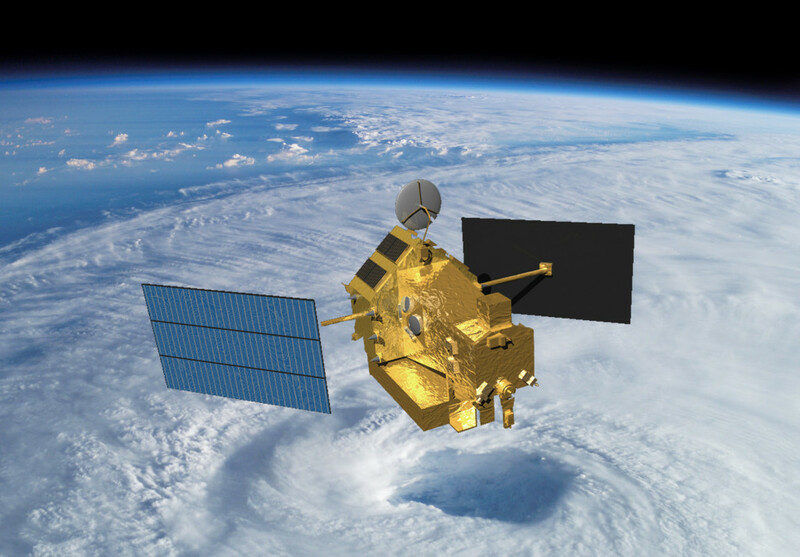 The GPM mission harnesses the combined scope of these spacecraft and uses the GPM Core Observatory to standardize the measurements from the individual satellites. Together, they are combined into uniform data sets that are made available online. Just as with TRMM’s data, anyone in the world can access the repository. In addition to the moderate and heavy rainfall that TRMM was capable of observing in the tropics, GPM also observes light rain and falling snow. Its orbit passes above a larger portion of the world. TRMM’s orbit covered the latitude ranging from 35 degrees north to 35 degrees south, which is as far north as Cape Hatteras, North Carolina, and as far south as Buenos Aires, Argentina, but GPM’s coverage of latitude from 65 degrees north to 65 degrees south stretches nearly to the Arctic and Antarctic Circles. The information these missions can provide is critical to people around the world. The data provided by precipitation-related satellite missions can save lives in cases such as landslides and tropical cyclones. They also help improve climate models, which help predict what our planet may be like years into the future.